NICE is on pharma's side and provides England and Wales with secure access to new medicines, the Institute's programme director of technology appraisals has said. But Meindert Boysen told a London meeting conversations between the cost-effectiveness watchdog and the industry about value need to be conducted in a more open manner. “We're producing 80% positive recommendations, this is secure access. Many people think we're the institute of 'no', but actually we're the institute of 'yes'," he said. “We're the institute that is actually on the side of industry [and] we're protecting the patients from making the wrong decision." Addressing an audience of senior pharma and NHS representatives at QuintilesIMS' London base last week, Boysen said that neither the NHS nor NICE want to block access to new medicines. "The NHS is interested in managing access, not in blocking it," he said adding that NICE and pharma were "in the same business". Responding to the charge that NICE only exists to present a rationale for the use of resources, he said: “That's NHS England's job, it's not our job at all. Our job is to make sure we buy value. And if that value is increasing, then we need to buy more value." However, he questioned the industry's current approach to setting out the value offered by new medicines. “We know that many pharmaceutical companies have a list price that is completely determined by international reference prices [and] nothing to do with 'value'," he said, adding: "We have to be open to having a conversation about what we want to pay and can pay." 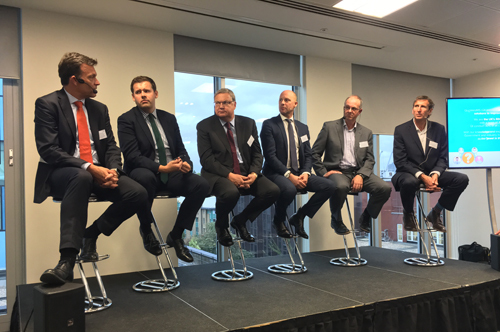 QuintilesIMS' Question Time: The Future of of Pharma and Life Sciences in the UK meeting came just one week after the publication of Sir John Bells' Life Sciences Industrial Strategy report. The ambitious pharma-backed report calls for value conversations to take place earlier through a new forum for early engagement between industry, the NHS and arms-length bodies, like NICE and the MHRA, that would be able to agree commercial access agreements. The Strategy also made a series of recommendations that would overlap with and supplement the Accelerated Access Review, including parallel processing of MHRA and NICE assessments, a single appraisal process and commercial discussion with NICE, NHS England and companies, and use of more flexible criteria to assess value. Boysen seemed supportive of that general approach. "Surely if we would have the conversation at launch, or at development of a new medicine, that's when these things matter," he said. “What we've been scared of, us and industry, is to sit down with the payer and have these conversations not in secret, but with our eyes open, understanding each other's position for the good of the country, and that's what Sir John Bell clearly indicates." The QuintilesIMS meeting also discussed the scale of the health technology assessment challenge presented by personalised medicines, particularly in oncology. Earlier this year Merck & Co's cancer drug Keytruda became the first approved by the US FDA for a specific tumour biomarker, without regard to the tumours original location. “At the moment personalised medicine scares us, because where we were used to a cancer medicine with three, four indications, now some of them have 20, 30 indications," Boysen explained. "There are cancer medicines that are licensed in the US without 'lung' or 'breast' or 'colorectal' attached to it, it's just for 'the tumour'. How on earth we're going to do our work is unclear, and even then - and this is where we're focusing - how do you then manage access?" Another of the meeting's speakers was Ben Howlett, director of Public Policy Projects and the former chair of the first parliamentary group for rare, generic and undiagnosed conditions. He noted that, given the high number of personalised drugs coming to the market it was going to present the Institute with "an intractable issue". "NICE is going to have to be an office of saying 'no' more than it is an office that says 'yes'." The event also heard industry praise for the Institute from the ABPI, despite the body having launched in July a judicial review of NICE's budget impact test. This went live in April and allows NICE to delay access to drugs that it has already judged cost-effective, but which are likely to cost the NHS more than £20m in any of its first three years of use. "NICE does a great job," said ABPI chief executive Mike Thompson, "and they need some support to evaluate the wave of precision medicine which is coming through. At the moment they're constrained from looking at things like different prices of different indications, we need to release that to allow to work to go on". "But the fundamentals of this country are fantastic and Brexit sets us an 'exam question': Can we respond to things? In which case I think there's a fantastic future. If we fail to respond to it we're going to have some hard times and the Sir John Bell report gives us a blueprint and it requires everybody to pull together. "It will require some politicians to show some real leadership here, but it requires all of us to provide leadership. Brexit gives us a time bound period in which we've got to answer these questions."